Karl Rove ripped into liberal bloggers at a web politics conference this week, assailing the "angry kooks" on the "nutty fringe of political life" who have seized "inexpensive and easily accessible" platforms to upend public debate. Ever the strategist, Rove also emphasized that he is a "fan of many blogs." So how does he know which ones are good? Apparently blogs affiliated with the liberal netroots are the problem. My point is not that liberals swear publicly more often than conservatives. That may be true, but that’s not my point […] It is that the netroots often argue from anger rather than reason, and too often, their object is personal release, not political persuasion. Several people have pointed out the blatant hypocrisy here. Rove is famous for a political career built on the most vitriolic, angry and immoral approach to public affairs. He is an equal opportunity slander operative, smearing John Kerry and Ann Richards with the same intensity as he sabotaged conservative "allies" like John McCain and John DiIulio. But dealing with Rove, there’s a political lesson here too. 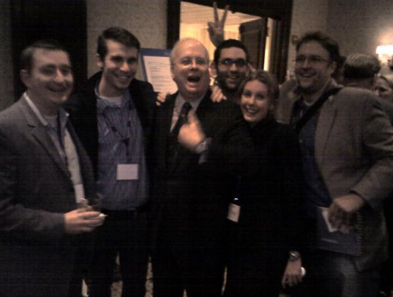 Karl Rove poses with bloggers at Yahoo’s "The Rise of Citizen 2.0" conference on Thursday. Photo credit: Clay Johnson. But the real question is whether any Democrats (or reporters) will naively take another self-interested Republican attack at face value. Rove is simply attacking liberal bloggers because they are effective. Deep down, he might even admire their aggressive approach to politics. Ironically, that would be another thing he does not have in common with many Democratic leaders. UPDATE: Washingtonian reports that during the conference Rove also IM’d with MoveOn.org Washington Director Tom Matzzie, whom he criticized during his remarks: "This is rove and I did take your name in vain […] Have enjoyed listening to your calls!" It’s not clear if Rove was joking about domestic surveillance, referring to MoveOn’s political autocalls, or something else.